Would I be mad to consider returning to Origin? / Would I be mad to consider returning to Origin? 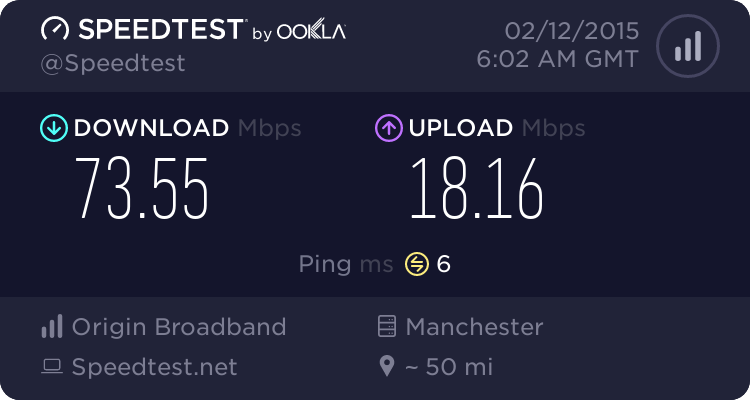 I ditched my DR connection with Origin and switched to BT before I could be affected by the whole migration debacle. I chose BT to take advantage of their cheaper TV service, when compared to Sky. One year on and with the BT contract coming to an end, we've taken a good offer to rejoin Sky TV for a year and I'm now looking at cheaper phone+FTTC providers. BT don't seem too keen on retention offers right now, so it's looking like Plusnet is the next obvious choice. BUT.....Origin is very cheap right now . Should I consider going back or is that a stupid idea based on their past performance? Anyone on here have any feedback on their service in the post DR era? What about the future security of the business - what would happen to connected customers if the company became insolvent? RE: Would I be mad to consider returning to Origin? What about Sky? Their broadband service for me has been excellent, never missed a beat. They might give you a decent offer if taking TV as well..
SLY will almost undoubtedly offer you a good deal for fibre broadband but not sure about the phone line. That said - migration debacle apart (and that wasn't all entirely their fault) I can't say I have had bad service from Origin. Maybe not the best in class, but very very far from the worst. IMHO. I'm not opposed to taking the BB from sky, but with no line rental saver option and a dearer basic price than PN, it's hard to imagine them offering a more attractive deal. I'm also a bit wary of going the unbundled route because I'm concerned it would make switching away a bit harder. Origin have some cracking deals at the moment, particularly the line rental saver. I'm just thinking that for a small company to be undercutting much bigger competitors like that, it seems too good to be true. I want good value but have always believed in the old adage, 'you get what you pay for'. From a moral standpoint, I don't like their apprentice wage policy; OTOH if everyone were to take the high ground and boycott the company, those lads would be out of work altogether. Sorry to be blunt but yes you would be MAD to consider going back, i took there new service on Origin aka Talk Talk Business, and they have a major lack of knowledge and control over the the product which they are selling taking weeks to even start looking at problem before actually raising with the supplier, they as much as they don't keeps us updated the customer they don't bother chasing the supplier. any company is a good company until you have experiencing with they dealing with issues and Origin don't have a hope in hell, they are the worst company i have ever had to deal with. Origin - Run for the Hills and don't look back. If you want further information on my Issues with Origin feel free to PM me. (10-02-2015 01:21 PM)fibretyke Wrote: I ditched my DR connection with Origin and switched to BT before I could be affected by the whole migration debacle. I chose BT to take advantage of their cheaper TV service, when compared to Sky. The lack of 80/20 on Sky isn't much of an issue as I don't get more than 40Mbps sync on the DL except during the depth of winter. Right now I'm on fastpath and just achieving 40 actual DL speed, but I'll be slowed down by interleaving when it warms up. PN won't offer me more than the 'up to 38Mbps' product as their speed estimator says I can only get 35Mbps DL. I can get 12 meg upload so it would be shame to have that limited to 10, but am I right in thinking that the 10 meg upload limit has been scrapped, because ISPs aren't quoting it any more and all new connections use 17a these days? @rooneybuk thanks for sharing your experience, I'll certainly bear it in mind. I'd love to try Zen but they looked a bit dear last time I checked. @rooneybuk They only connect people to Talk Talk if you aren't on an Origin exchange. The only problem I have with Origin is my connection only ever peaks at 70Mbit and averages 66Mbit, I had expected it to be nearer 76MBit as some people on BT have recorded. Gaming performance has always been fine. Have played Assassins Creed Unity in CooP many times and only once saw someone lag out, it seemed it was their connection as every other player was fine. Holy crap, hell must have frozen over. @alexatkin, i'm not sure if BT have been making changes or if the cabs are receiving a lot of crosstalk or too many users on them now, as I used to constantly receive over 75Mbps and now averaging 67-69Mbps - I need to have a wander as well to determine if BT have actually moved me from 1 fibre cab to another (and removed originally cabinet) as when the DR cabinet disappeared a new bt fibre cab went up and were the original bt fibre cab I am (or was) connected to was a small one and could not be upgraded. Thanks for all your input, the deal I'm taking is PN 40/20 fibre with an introductory price of £3.75 for 6 months. Combine this with £80 quidco cashback and the average price of fibre over the next year will be under 3 quid. Explained this to BT customer options and they said they couldn't touch it, issued a MAC without any argument. I would've like a line rental discount but I already phoned BT earlier in the week and was told they can't do any line rental deals at the moment. In fairness, they're not dearer than PN because PN cancel out their cheaper price by charging for caller display. Looked at Zen but still find their prices on the hefty side, and they appear to be charging more line rental to BB customers than they do for standalone phone!